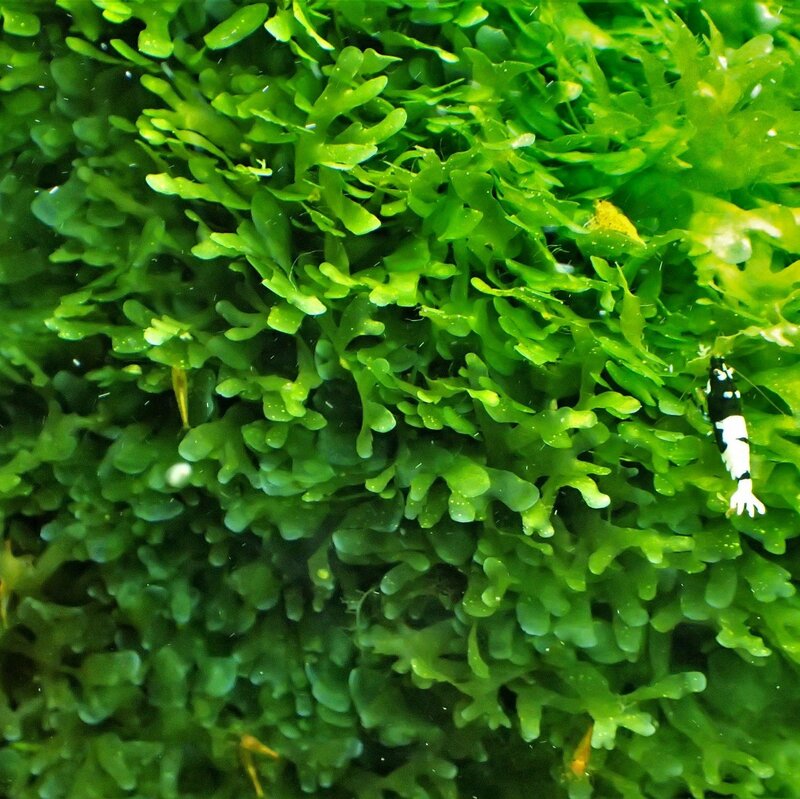 ⭐⭐⭐⭐⭐ Subwassertang Is a slow-growing liverwort aquarium plant and is hands down my absolute favorite plant in a shrimp tank setup as it provides lots of cover for small shrimp and berried females looking for a place to have their young, it also grows very large and a vivid bright green color with a broad surfaced congealed leaf structure for your shrimp to graze over. Subwassertang while slow growing can reach around 10-15cm a year in diameter and it does very well free-floating or attached to things like driftwood or rocks, it can also self-attach itself to things like glass in your aquariums so think of the growth of this plant like a spreading bacteria in a culture plate, I use thread or very thin fishing line to lightly bind subwassertang to an object I have also tried to use superglue to attach subwassertang to things but the plant really didn't like it at all, the broad leaves would turn white and eventually break away from the item, also when this plant gets very large it can rot near the center causing it to detach itself but this is very easy to fix. For ideas on what to do with your subwassertang see my videos below, you can also make Subwassertang ropes to hang in your aquariums which look very attractive once they fill in or you can attach it to things like driftwood, it will also attaches to things like a rock. Subwassertang also likes a medium flow rate in a tank. The Subwassertang I sell might also contain the odd piece of duckweed and it might also have snails in it but I do try my best to remove all visible things that shouldn't be there if you want 100% pest free plants you need to buy invitro plants and not from me. You are buying 8g of Subwassertang, for reference that is a large golf ball sized piece.